Ken Sullivan and his wife, Michelle Palomera Sullivan, are sharing their family’s story. In 2012, Ken Sullivan began struggling in his job at a financial services firm in Boston. He had always gotten good evaluations, but was feeling stressed, anxious, more disorganized, and less outgoing. The year before, his wife began to notice that he would go out on errands and return home without having done them. “One time he forgot to pick our friends up from the airport,” she says. And he would leave the stove on while he was gone, once causing a pot to explode. In 2013, Sullivan was let go from his job. At age 47, with two young daughters, he looked for other work, to no avail. When the couple, who married in 2001, sought medical advice, doctors told them his symptoms were the result of stress, and prescribed an anti-anxiety medication. “It was like pulling teeth to get a referral to a neurologist,” says his wife, Michelle Palomera Sullivan. In June 2013, after a battery of neuropsychological tests and an MRI, a neurologist finally put a name to it: early-onset Alzheimer’s disease. The couple, who live in Scituate, know the phrase terrifies a whole generation of baby boomers, and that is why they decided to go public with their story. More than 5 million Americans have the disease, and it is the sixth-leading cause of death, according to the nonprofit Alzheimer’s Association. But most patients are elderly. Neurologists, too, should be “more aggressive,” she says. Though there is no cure for the disease, Sullivan is on a couple of medications that reduce some of the symptoms, as well as an antianxiety drug. But they do not halt the progression of the condition. He is enrolled in a clinical trial where he gets his medication — or a placebo — once a month. “I feel good, but fatigue is my enemy,” he says. Palomera Sullivan is a managing director at a software design consulting firm, and their girls — Leah, 9, and Abby, 11 — are busy with school and extracurriculars. “I was hunkered down here, wondering what I was going to do next,” says Sullivan, who is now 48. He began to volunteer with the Alzheimer’s Association and was recently named an early-stage adviser, speaking to groups about awareness and education. “My role is to tell my story,” he says. But her husband says he is “socializing” the disease. “I play golf with friends, I helped plan my high school reunion,” he says. “Social and physical activities help me cognitively.” His biggest issue, he says, is his short-term memory. 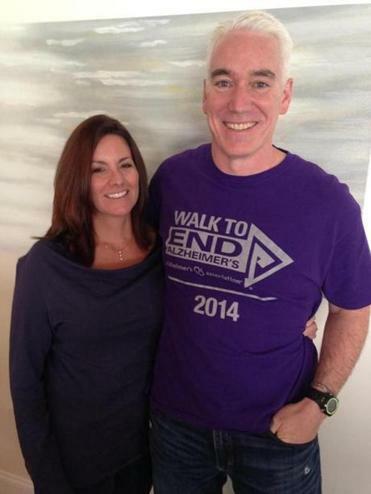 In April, he and his wife lobbied Congress to fund Alzheimer’s research. “A staggering amount of money is spent on caring for people with it, but they should put money into [researching] it like they do cancer and heart disease,” she says. Sullivan has been asked to read a television script for an ABC sitcom featuring a family dealing with Alzheimer’s. He has spoken to Harvard Medical School students. And he and his wife recently spoke at an MIT AgeLab program about financial planning and the disease. Through solicitation and pledge walks — and their girls’ lemonade stand for Alzheimer’s — the family has raised $65,000 for the cause. At home, Palomera Sullivan does the errands and the household finances. Sullivan volunteers at the Friendship Home in Norwell, where he teaches finances to young adults with mental disabilities. On Nov. 12, at Black Rock Country Club in Hingham, the couple plan to attend a question-and-answer session and signing by Greg O’Brien, a veteran journalist with a new book about his diagnosis at age 59: “On Pluto: Inside the Mind of Alzheimer’s.” Ken Sullivan is slowly but surely making his way through the book.